If you're anything like me, your car can be like your second home. With three kids, I feel like I'm always in my van. I shuttle them back and forth to school, to practices, and to sleepovers. 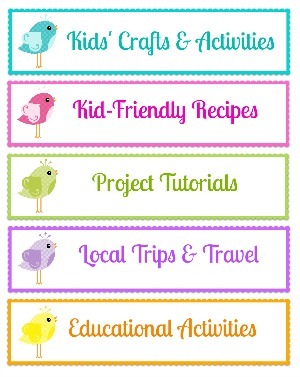 We go to the library, the movies, the grocery store, the doctor, the dentist - well you get the idea. Embarrassing, isn't it? Water bottles and crumbs all over the place, my son's basketball uniform from when he had to do a quick change in the car, my daughter's robe from her last sleepover, various books and papers - really a little of everything. And even though I didn't take a picture, my section of the van isn't much better, with empty travel mugs of coffee, receipts, and a pile of books to return to the library. Now, while we do clean out the van before things really start to smell (usually! ), it definitely doesn't smell as nice as I'd like it to, especially considering how much time we spend in there. That's when I was really excited to have the chance to try out this new kind of vent air freshener. 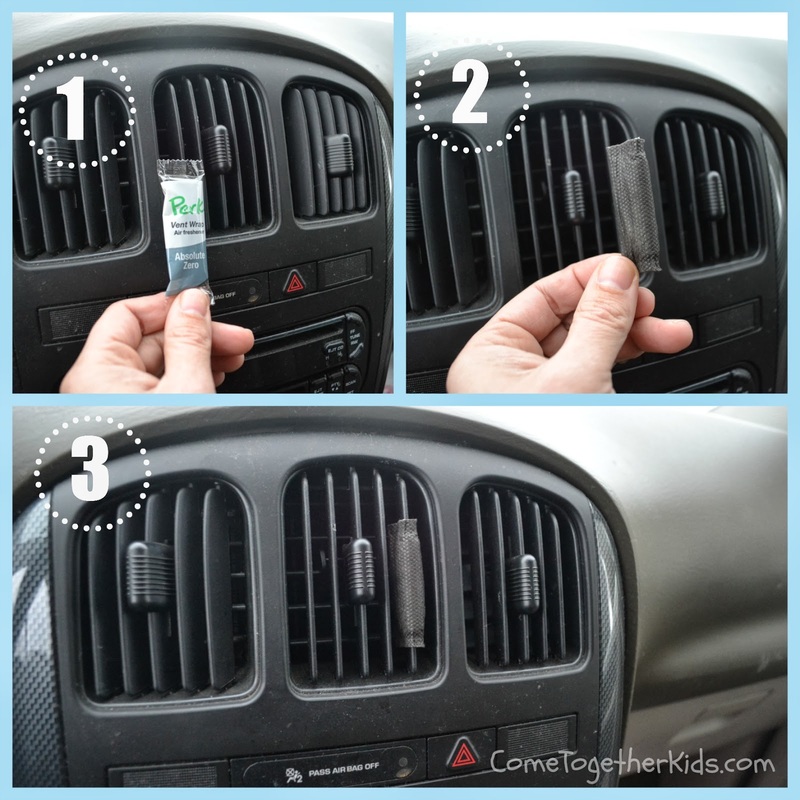 Now, I've tried other vent air fresheners in the van before, but it was always a pain to correctly open the container of liquid scent and get the clips to attach properly to the vents. Nine times out of ten, I'd end up spilling it when I was trying to put in on or the whole thing would fall off the vent the first time I'd move the vent to adjust the air flow. Each package comes with four individually wrapped vent wraps. I chose the Absolute Zero scent (to go with our frigid temperatures we've been having lately) but they also come in New Car, Clean Laundry, Lush Valley and Golden Vanilla. 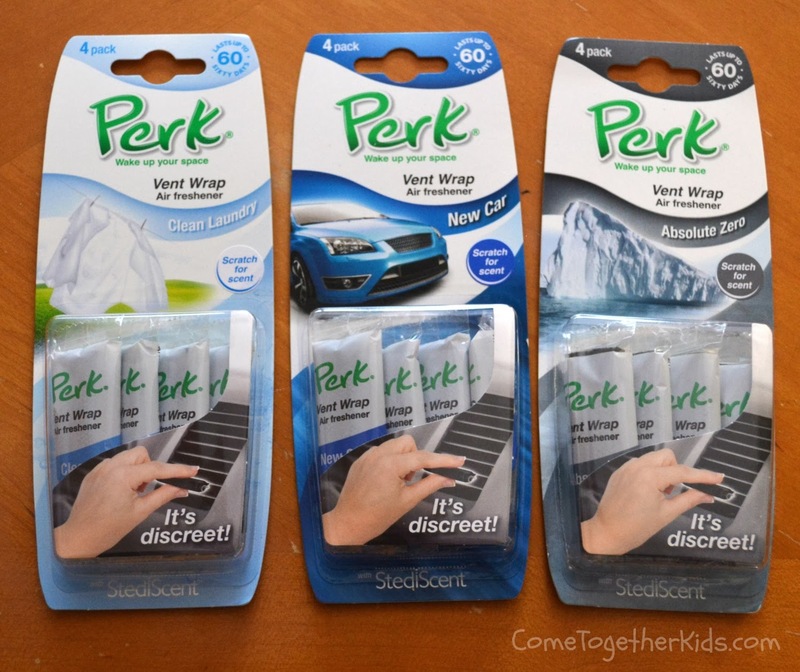 All you have to do is open the small package and slide on the PERK Vent Wrap. Instead of a messy liquid, the wrap is infused with StediScent® technology. The wrap doesn't block the vent and you can still easily adjust the air flow without having to worry about it falling off. Each individual PERK Vent Wrap lasts for about 2 weeks, so a package of four will last about 60 days. 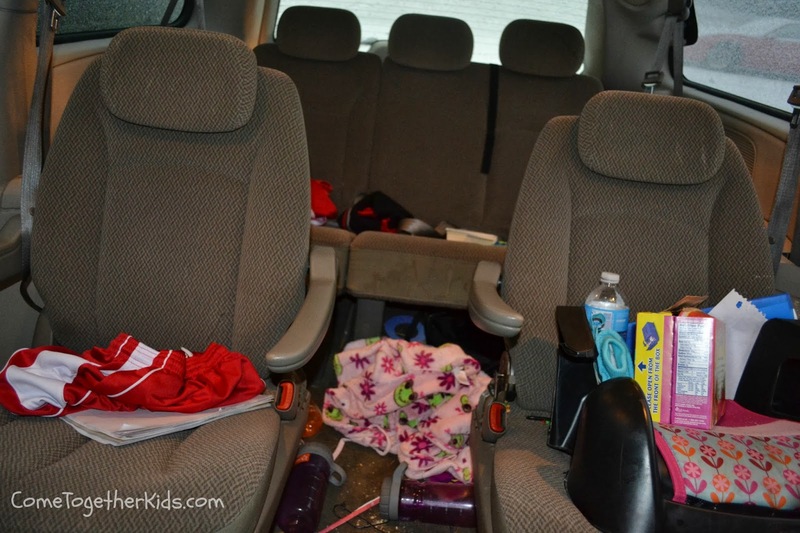 Well, I have 3 kiddos too and our mini van can get really yucky. I got my first new car a few months ago and i'd love to be able to keep the "new car" smell! Our mini van can use some freshening up too! I always say I'm not going to allow my kids to eat or drink in the car but here we are still eating and drinking in the car. Just the other day my son said that my daughters milk cup was on the floor.....yuck-o! Definitely could use a smell better than milk!! Right there with you. I won't even mention the apple I found that rolled out of a bag and was living under one of the seats. I think clean laundry smells better than rotting apple. 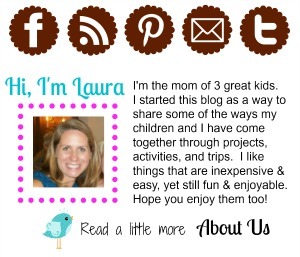 I have 4 kids (and a husband), enough said!! A milk spill in the car a year ago has left behind a yucky smell. I've tried everything I can think of to take the smell away, but there's still a slight stench. And now I'm pregnant, so I smell it strongly. My Taho gets used to haul everything home in....it needs a little help!! Field hockey and lacrosse carpool. That is why I need these vent wraps. And whoever said girls aren't as stinky as boys needs to get their nose checked. Yup, that's about what my van looks like! Only, mine has more crumbs!!! I was looking through a lot of your posts and wow did it bring back some great childhood memories! I grew up in Sykesville, Howard County MD. I went to a ton of the places you listed in your trips category. Thanks for the great flashback!! I am now in New Mexico and love it- but it's fun to think of all the cool places I went as a kid. I am also going to use the summer fun list idea you showed on a post. My kids are already psyched about it! Why do you wish to shed weight? Do you find it as you wish to look good to get a special event? Have you ever a family occurrence or trx workouts perhaps type gathering to wait this coming year, the issues could be numerous. Generating your own personal atmosphere freshener can be possible. Research dishes on the web in addition to try things out to locate exactly what befits car scents you the most effective. It becomes best to utilize a thing that can last and contains deodorizing functionality. Just look your post and pics. Thinking about my plan to have 2 or 3 children. OMG!!! That was an pretty impressive post and i love it. Thanks for this great article. Can anyone tell me the exact release date of Galaxy Note 7?? We have a few ideas that would make Sims 5 a solid improvement upon its predecessor. Happy Diwali 2016 Greetings Wishes, lot of best and wonderful collections of quotes is about achieve success and happiness with every light on the day of Diwali with good health and wealth. Happy Diwali Greetings Wishes 2016: on our best we have a collection of pictures, images, wallpapers and many more things of happy Diwali Greetings wishes are available and creative online portal. That is an really awesome post and i appreciate the way article is written. I can't say that I didn't like this post but I have a few questions about this. Can someone tell me how to communicate that with the right person here? I read alot and this is a thing that clicks my interest. Thanks for sharing this awesome post to us. That was an one of best post and i would like to share it with my friends. Thats amazing stuff and I am so delighted to be here and to gather this nice article. Farewell to the current year, and welcoming of new year, should surely be special. What can be a better way to ring in to 2017 at then joining some of the biggest new year parties in the city. So if you are still not sure about how to celebrate your new year eve, we suggest you some place where you can head on to make your and your loved ones’ eve special. I just came to this site and brought me along. Oh yeah, this is what I'm looking for. It is good for many people. The growing number of essay writing services is completely overwhelming. Sure enough, it’s hard to miss an essay writing service by the few steps you make. Every service is striving to be the best. The costs incurred in advertising to the audience in order to earn more customers are a lot. Their efforts have been paid back: students are embracing essay services more than ever. On getting that assignment, the next search is for an online service. The list that pops out is endless and where confusion begins. If you would like to find info about “essays websites“, welcome to Scamfighter.